BACKGROUND: Canada has some of the highest cellphone rates in the world. Lucky Mobile is set to counter this situation and provide Canadian consumers a choice by offering a low-cost mobile solution. Lucky Mobile, launched by Bell Telecom, has liberated the market by offering cell service without a credit check (a bane of newer immigrants who compose a growing segment of Canada’s consumer market), no long term commitment, protections against overage charges, and affordable overseas calling. OUR WORK: Sunflower Media’s ethnic marketing team provided our expertise of Canada’s multicultural marketing landscape via media recommendations. 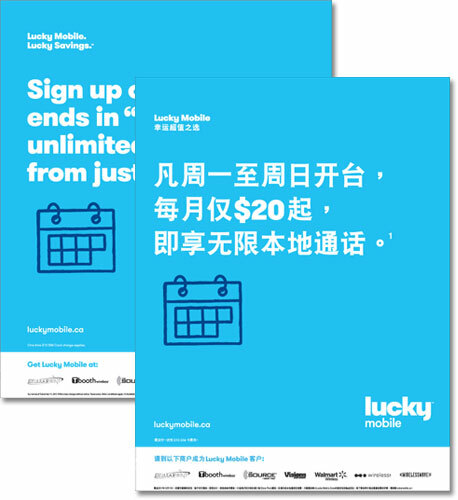 This launch campaign for Lucky Mobile ran nationally in Chinese, Filipino (Tagalog), and South Asian print media.